Episcopal Church. Diocese of Georgia. Bishop (1841-1866: Elliott) Address of the Rt. Rev. Stephen Elliott, D. D., to the Thirty-Ninth Annual Convention of the Protestant Episcopal Church, in the Diocese of Georgia. Address of the Rt. Rev. 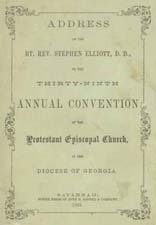 Stephen Elliott, D. D., to the Thirty-Ninth Annual Convention of the Protestant Episcopal Church, in the Diocese of Georgia. Savannah: Power Press of John M. Cooper & Company, 1861. Church and state -- Confederate States of America. Church and state -- Episcopal Church. Episcopal Church -- Georgia -- History -- 19th century. Episcopal Church -- Southern States -- History -- 19th century. Episcopal Church. Diocese of Georgia -- History -- 19th century. Episcopal Church. Diocese of Georgia. Convention. Georgia -- History -- Civil War, 1861-1865 -- Religious aspects.